Google vs. KakaoTalk: How will App Discovery Evolve? A few days ago, I came across an interesting report stating that Google has attempted to sway South Korean developers away from KakaoTalk's mobile gaming platform. Assuming the report is factual, let's take a look at Google's motivations in context of the potential threats to their business model. Currently, most of the Korean-based mobile gaming companies launch their games on Google Play and the KakaoTalk platform at the same time. Google charges 30 percent of the total profits as a “distribution fee,” whereas Kakao collects 21 percent as a toll charge. When using distributors, game developers make only 24.5 percent of the total game revenue. Google Korea, however, reportedly indicated its intention to local mobile game developers to provide various kinds of support for their successful penetration into the global market, on the condition that they do not launch their games on the KakaoTalk platform. The suggestion is apparently worth considering, in that game companies would not have to pay Kakao’s 21 percent fee. Moreover, they can be provided with marketing support through Google Play, which is an important tool for their overseas expansion. As I explained in my last post, Google's biggest asset is user data. And currently, Google does not have access to data from the most popular activity on mobile devices -- gaming. Google Play Games is one way to attract both consumers and developers to a viable gaming platform that also gives them access to user data. Unfortunately, KaokaoTalk's mobile gaming platform offers roughly similar features with an added benefit -- it eases distribution by giving a curated list of mobile games to their engaged audience. For games on these secondary platforms, integration with Google Play Games is less of a necessity. Therefore, it may be in Google's interest to minimize the popularity of secondary platforms among developers in exchange for enhanced distribution support. 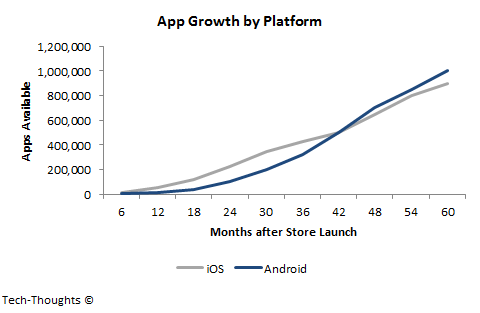 As app discovery becomes more challenging, the costs associated with distribution will continue to rise. In the excerpt above, we can see that developers retain less than 50% of revenue when using distributors and secondary platforms. Eliminating KaokaoTalk's 21% revenue share would increase developer profitability, but only if distribution reach remains the same. Enhancing profitability, even among a curated set of apps, would increase the attractiveness of the Google/Android ecosystem which could attract even more developers. A potential disruption to search could be the biggest possible threat to Google and probably the most difficult one to understand. Today, KakaoTalk's model just focuses on a curated set of apps. While that eases app discovery, it doesn't really constitute a scalable threat to search. However, the situation could change if messaging apps explore a more scalable, algorithmic approach -- especially if consumers begin to view the KakaoTalks of the world as app discovery tools. At that point, Google Play could be relegated to a simple repository for apps. But why is that a problem for Google's business model? The answer to this question depends on how app usage evolves. Are native apps and the web two independent engagement models or will they converge over time? I don't have an answer to this question but if they do converge, app discovery and search may not necessarily remain independent. In this case, Google may need to control app discovery to protect their position in search.